When will the chef love affair with the burger stop? If we’re lucky, never. French chef Laurent Tourondel loves creating incredible versions of American classics, like this stellar burger. Star chef Tyler Florence blends ground prime rib, brisket, skirt steak and tenderloin for his ideal burger and tops it off with bacon, lemony mayo and triple cream cheese. (Brie works well, too). You’ll want to double Bobby Flay’s recipe for smoky, spicy peanut sauce—it’s fantastic with burgers and steak and you can keep in in the refrigerator for up to 2 months. The deeply flavorful chile relish on chef and restaurateur Tim Goodell’s excellent egg-topped burger requires just two ingredients—green chiles and garlic—and a few minutes to roast them. Washington, DC, chef Kyle Bailey hides grated cheese inside his burgers and tops them with vinegary pickled cabbage before serving. Bobby Flay strikes again. This gooey tortilla-chip-topped burger is an F&W staff fave. Yes, this burger contains the Umami Burger special seasoning along with two grown-up toppings: Reduced port and stilton. Chef Suvir Saran blends diced bacon and cheddar into his maximalist burger blend and then tops the patties with a spicy yogurt sauce. 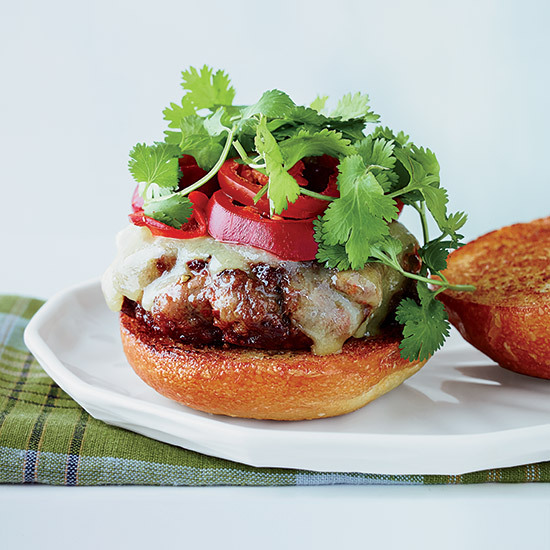 Sambal mayo is the condiment of choice for Vermont chef Wesley Genovart’s over-the-top burger. Boston chef Joanne Chang makes oval burger patties so she can serve them on a baguette with spicy mayo, pickles and cilantro, like the Vietnamese sandwich. How does a barbecue master do a burger? Just like this. Chef Michael Symon has a genius way to season his burgers: Mix in sausage meat. Chef Jamie Bissonette’s burgers combine cheese, pickles and onions along with other meatloaf ingredients. He then tops the patties with a quick doctored ketchup sauce.